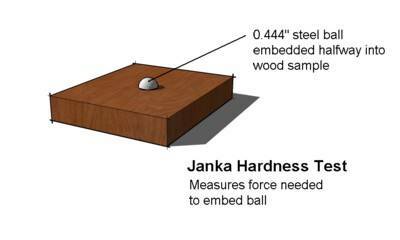 The Janka Hardness Scale measures the force required to drive a .444-inch steel ball into a piece of wood so that half the diameter of the steel ball is embedded. The higher the number, the harder the wood species. This test measures a wood’s ability to resist dents and wear. It also indicates how difficult it is to nail or saw through the piece of wood. Brazilian Walnut or Ipe is the hardest of the most popular hardwood flooring types and has a Janka rating of 3684. Eastern White Pine is the softest at 380. The Janka Hardness Scale can help you determine which hardwood is best for your floors. However, the rating is most helpful when choosing floors that you would like to see natural wear in over time. Softer woods, like Firs, lend themselves to the worn in, natural look. When looking for woods that won’t show this kind of wear, we can’t completely rely on the Janka Scale, as scratching is a possibility for even the hardest woods. To decrease the visibility of natural wear or scratches, choose highly grained woods like Oak or Ash, keep mats down in high traffic areas, and regularly clean and maintain your floors.